In keeping with the theme of anniversary celebrations begun yesterday (when we recognized the 150th birthday of pioneer missionary H. Frances Davidson), today’s Photo Friday installment concerns Roxbury Holiness Camp, which will celebrate its 75th anniversary when it meets for annual two-week meeting in July. 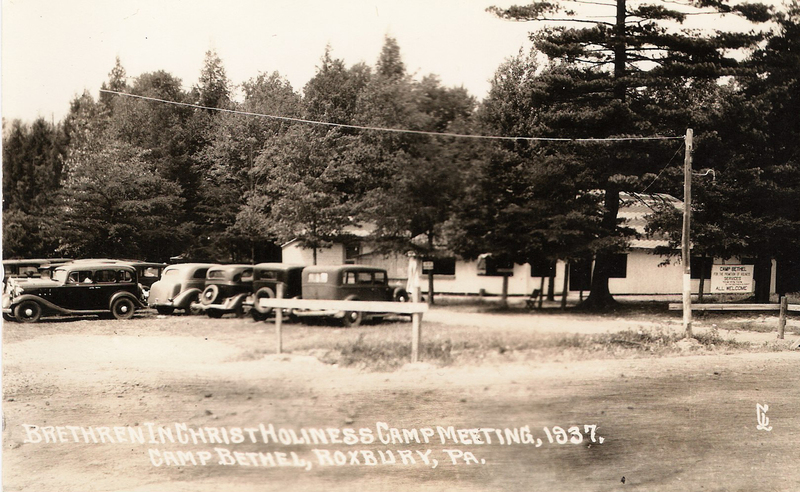 The postcard-image above shows the Camp in 1937, just two years after meetings were first held on the grounds of the former dance hall. In recognition of Roxbury’s diamond anniversary, the Brethren in Christ Historical Society will publish a “new book telling the Camp’s story,” according to the recent edition of the Society’s newsletter. Look for a review of the book on “the search for piety and obedience” later this year! Thanks, Devin, for including this. This year’s camp meeting will be held from July 30 to August 8, with a special anniversary cake served at noon on Sunday, August 1. You may get a camp meeting brochure listing all sessions, speakers and music concerts by contacting the Camp at: [email protected]. Thanks for the comment and info, John. How did you happen upon the blog? As you may or may not know, I attended my first Roxbury Camp last year — quite an experience! Not quite sure yet if I’ll make it to the celebration or the Historical Society annual meeting this year, but I’m excited to read Dr. Sider’s book.